Joni Ernst, the Republican running for the open seat in Iowa, has had almost every presidential hopeful campaign for her. Thom Tillis, the Republican nominee in North Carolina, has had visits from even more of them. North Carolina’s legislature voted last year to move the primary to the Tuesday after South Carolina&apos;s contest, placing it in the early group of presidential primary states. The chart only includes in-state events with the eventual Senate nominee. As a result, not all White House hopefuls&apos; efforts made the cut. For example, Louisiana Gov. Bobby Jindal campaigned for Ernst at her state office on a day she wasn’t there. Jindal put much of his effort into campaigning for House candidates, while New Jersey Gov. Chris Christie&apos;s perch as chairman of the Republican Governors Association means he has campaigned predominately for governors. Texas Gov. Rick Perry has stumped for Republican candidates up and down the ballot in Iowa and around the country. Former Florida Gov. Jeb Bush a number of Sunshine State fundraisers for Senate candidates, including a big one to benefit Ernst and other candidates. Christie and Sen. Ted Cruz, R-Texas, publicly sang the Iowan&apos;s praises at events in Iowa for other candidates. Sen. Rob Portman, as vice chairman of the National Republican Senatorial Committee, has helped out every Republican nominee so far this cycle. 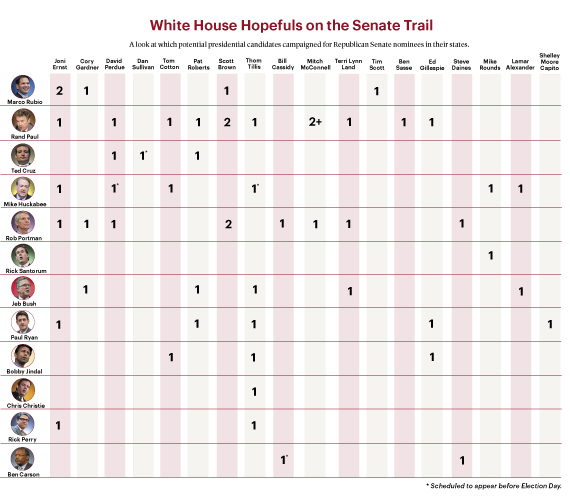 For the Democrats, potential presidential candidates also campaigned for Senate nominees. But given the small number of candidates looking at the race, that&apos;s a much less revealing chart. Ratings Changes in Key Senate Contests Democrats Losing Youth Vote: Millennials Turning to the GOP A Nerve-Wracking Finish for Democrats Democrats Run From Harry Reid New Ad Attacks Joni Ernst on Education Roll Call Election Map: Race Ratings for Every Seat Get breaking news alerts and more from Roll Call in your inbox or on your iPhone.